Julian tipped his head as another unannounced figure appeared from beneath the tree branches. His blank stare flitted from the two. The watcher greeted his alpha very warmly and he silently waved back to the female. "Uh..." He paused, unsure what he was going to ask. He suddenly had a lightbulb and turned to Mr. Davis. "Can you tell me how that," he pointed towards Raizil's swelling belly. "Happens?" His blank stare was a little unnerving, but his curiosity hadn't be sedated yet. Rai smiled and lightly punched Jan in the shoulder. "I dont want to sit around and get catered to, im not like that. Though i have to say maybe i wont be able to hunt anymore. Damn prey has either gotten faster or..." Rai trailed off as she heard the question that Julian asked. She blushed as she remembered that night. "Ummm...well when you find a mate and you both love each other you want to show just how much you love each other and sometimes the female ends up pregnant like i am. In my case its a great thing because as the alphas Sam and I are required to produce heirs to run this clan after us." Rai mentally sighed. She then using her mental link since Sam and her had completed the mate bond, she reached out for him, " Samuel come rescue me, before Julians questions get a little more detailed." Rai pleaded. Sam couldn't believe that ten years had passed so quickly. It was like yesterday he came here and took over the clan, ruling side by side with Raizil, the alpha female of Moon Clan. Yet for those ten years a lot of things happened. The war between the clans ended without bloodshed which was good news for the werewolves. Moreover, the vampires held a meeting where they sighed a contract which said that they would make their best to keep the peace between eachother. The same night, Sam and Rai were invited to the first fight ever held in the vampire's arena. The fighters were the ex-king and a girl who he had transformed. Having in mind that Casper was dear to Rai, his mate didn't stay and somehow got angry on Eliza. Samuel, no matter how much he wanted to stay and watch, left together with his mate, showing his support to her decision. Another thing which changed was his attitude towards Raizil. He finally found enough strength in himself to confess his feelings for her not only before her. He made sure everyone knew that. Sure they still did have some disagreements but nothing could really change the feelings he had for her. Not only was he happy with his loved spouce but he was about to become father too. Moon Clan was prospering and that for sure brought happiness to each mmber of the clan. As usual, Sam was sitting in his den, trying to read some messages from some clanmates who he had sent into the village. Reading was hard for him, because as a child he never had the chance to learn how to do it. It was all about fighting and hunting, which he truly enjoyed. However, he wasn't happy with the fact he could not read properly. That's why he was planing to send one of his future children in the village, where he or she could get good education. Hearing his wife's thoughts, the werewolf king quickly got up and left the den. With a few agile steps he appared next to Raizil. The man gently wrapped his handaround her waist and pulled her closer, somehowshowing to the other males that she belonged to him and nobody else. Sam kinda had sence of ownership towards the white haired girl. "Haven't I told you not to go hunting anymore? There are enough males in the camp who can do that job, am I not right?" saying his last words, the alpha male looked at the two men which a minute ago spoke with Raizil. Rai felt the relaxing touch of her mate as he wrapped his arms around her waist. "You know i dont like feeling helpless. I thought i could still hunt, geez. It not my fault im pregnant with your pup, this pup sure is a little kicker. I tried to catch a stupid rabbit and it starts kicking me something fierce. But i promise no more hunting for me, alright. I cant even keep up with the stupid prey. " She said outloud but through the mindlink. "I feel your frustration and i know it isnt at me. Please share your burden with me. " she asked Sam. Samuel raised his eyebrow at the statement of his mate. Hopeless? Why would she feel hopeless when she had maybe the most important role of all - she had to carry his heir. He sure didn't feel delighted when she accused him of making her pregnant but the king made sure no one would notice his expression. "Well, he is kicking because his mother is too stuborn to listen to her own mate. Or maybe because he feels a little bit squeezed in there." Sam suddenly placed his palm on her rounded belly and gently fondled it. However, the young man quickly stopped doing it after hearing his mate's thoughts. Sam was still not used to sharing his problms with Raizil. He thought it would be much better if she didn't know his burdens. That's why he decided to ignore her inner words and once again lookedat th males, sitting quietly infront of them. "I hope you two are not busy and will be able to make a tour around the territory. Julian would you please check up on the borders? And Jan, would you mind paying a visit to the village. We need some medicine supplies and other stuff which I would like to discuss with you in my den. On our own." Saying his last words, Sam looked at Raizil and nodded before letting her go. Rai knew that she had probably upset Sam when she accused him of making her pregnant. Bur if it did he didnt let it show. She rested her hand on top of his when he placed his hand on top of her belly. A smile was on her face but inside concern twisted in her gut. She did in fact notice that Sam didnt answer her question about why he was upset. But instead she sighed and decided that if it was really important he would tell her on his own. She nodded back to him. "Alright i supose i should accept the fact that i have to have help with a lot of things." Rsi said outloud but over the mindlink with Sam, "We must discuss what will happen once this pup is born. Because whether it be boy or girl they will be the next alpha of the clan and i dont know how Kenji will take to that. He doesnt know he is adopted and therefore doesnt have any right to the alpha title." The scholar chuckled at his alpha's pouting reply, rubbing his arm as she'd punched him rather softly. "Hmm...Or what, lass?" Julian finally spoke up, pointing rather unshamefully at Raizil's protruding torso. The dark haired man held his hand over his mouth, his shoulders shaking from silent laughter. The girl fumbled for words, trying to convince the other male of a more innocent outlook. Then Samuel entered their mists. The older male smiled a little before standing a bit straighter. The alpha wrapped his arm around the girl. Speaking her chastisingly as he had done just a few moments ago. He wrapped his arms together and smiled at the couple's intimacy. Samuel's possessive action assured him that Raizil was happy with the other male. Then he spoke up and asked him to go to the village to buy some herbs and other supplies. The werewolf nodded, his face taking on a more serious note. "What is it, Samuel?" He asked, a serene look still on his face. Julian tipped his head at Raizil's vague explanation. His curiosity had hardly been sated, and he opened his mouth to ask again, when their alpha appeared. The black haired male let his leg swing around to straddle the tree branch between his legs. He acknowledged the male with a slight dip of his head and a low grunt. He watched as the couple shared a loving moment. He remained silent, since he felt he should. Until finally the male spoke to the two males watching them. His alpha addressed him and directed him to patrol the borders. The scarlet eyed hunter froze, his eyes drooping in disappointment. He exhaled through his nostrils and swung around the branch to jump down. His boots thumped against the ground before he bowed his head again to the alphas. He waved silently before sprinting off into the brush. Raizil watched as everybody went about their own business, she was feeling really tired and somewhat sick so she decided to head off to bed. Normally she would climb the latter or jump up into the trees to get up to her home, but as her pregnancy got further along her stomach grew and grew and it became impossible to even climb so they temporally moved down to the bottom floor until the pups had been born and are old enough to climb to higher levels. She hoped she had a son first then a daughter because she wants a male to take care of the family and pack in case something were to happen to her or Sam. "Sam I'm going to retire to our home. I'm tired and I don't feel that well. Please don't stay out all night and if you see Kenji tell him I want him to hang out around the territory." Rai hadn't seen Kenji in like maybe two days and she worried he was getting himself in trouble, like maybe like crossing over to Crimson Fang. 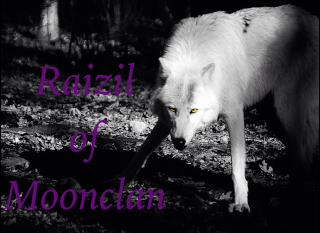 He always seemed to hang out with them than his own kind which Rai knew some wolves in the clan were starting to talk and look down on him because of it. Rai opened the door and made her way to their bedroom, getting underr the covers she tossed and turned until she felt comfortable. She sighed she missed the days where when she was feeling troubled she would just be able to go to Casper and he would give her some much needed advice. She would never be able to have that again at least not with Eliza in the mood that she is in. The werewolves and vampires werent at war with each other at the moment but she didnt want to upset the fraigle truce that they had made, by sneaking off to see her old lost love and friend, Casper. Plus she knew that it would make Samuel very angry with her, and she just got him to start opening up to her.